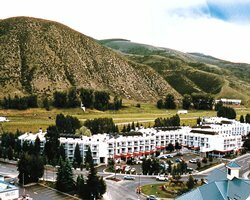 The Christie Lodge Resort is the ideal base for skiing Vail or Beaver Creek areas or hiking the mountains in summer. Located in nearby Avon, Christie Lodge provides comfortable, well-furnished 1 bedroom 1 bath units that measure a cozy 500 square feet. Each condo vacation rentals sleeps 4 adults, and has a queen bed in the bedroom, and a queen sofabed in the living room. There is also a daybed that could sleep a small child. Each of the Christie Lodge Resort Vail’s 280 guestrooms includes a furnished balcony or patio. All units are non-smoking. All condos have dining tables and granite countertops. Kitchenettes feature microwaves, refrigerators, coffee makers, electric skillets, dishwashers, and cookware (but, there is no oven). Rooms include wood burning fireplaces, TVs with Showtime and DVD players, and free Wifi. Many units boast mountain views. Get more information about condo vacation rentals at Christie Lodge Resort here. Review all available condo vacation rental availability at Christie Lodge and many other resorts with The Vacationator at Vacationator.net.